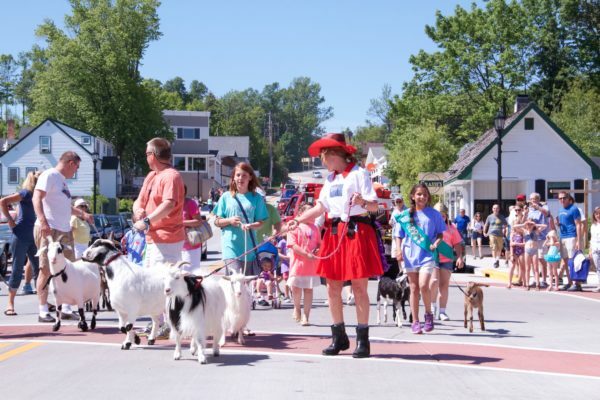 Well, THIS is an interestingly-named event: the Roofing of the Goats Parade takes place in Sister Bay on Saturday, June 8th, 2019 at 10:30 am right along Highway 42. All goats are invited to participate in the 7th annual Roofing of the Goats parade! Don’t have a goat? 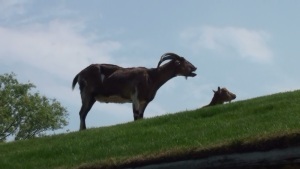 Then line up and watch the famous Al Johnson’s goats while they head down the streets to climb up onto the sod roof. They will be joined by many of their local Door County goat friends who will also be at the festivities. Goat costumes, goatees, Viking hats, and other creative endeavors are encouraged. The parade begins at the corner of Mill Road and Highway 42 in downtown Sister Bay, and goes a trot, kick and a leap down the road to Al Johnson’s Swedish Restaurant. The parade culminates with the roofing of the first goats of the season at Al Johnson’s (weather permitting – the goats don’t go on the roof in rain or snow). The Goat Parade will be followed by Al Johnson’s 3rd Annual Goat Fest, located at Stabbur Beer Garden, next to the restaurant. Goat Fest will feature all day festivities including: live music, kid’s games, various beverages, great food, and a Swedish Pancake Eating contest. Other businesses throughout town will also be celebrating with specials. Returning this year is the Goat Drop Contest. You can help support the Northern Door Food Pantry and have some fun. With a purchase of a goat drop sticker, you will be entered in to win a Trek Fat Tire Cruiser bike from Husby’s and Flanigan’s Distributing, a $100 gift card from Al Johnson’s, or a Lunch and Farm Tour from Door County Creamery. Stickers will be placed on the street along the parade route. 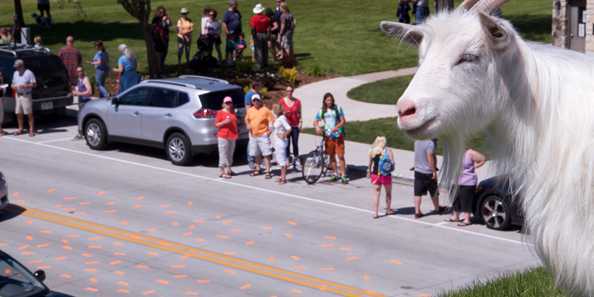 To win, a Goat must make a deposit on your sticker during the Goat parade. All proceeds will go to the Northern Door Food Pantry at the Sister Bay Baptist Church. Stickers will be available for purchase at the parade, or if you can’t attend you can still join in on the fun and purchase your stickers online. You do not need to be present to win! Buy your stickers HERE. After the parade, Goat Fest at Al Johnson’s will begin, and includes Live Music, Kids Games and Crafts, a Swedish Pancake Eating Contest and more.